Tsurumi single-phase portable dewatering pumps are compact and lightweight, so they are very easy handle and carry. Available in an extensive lineup of motor outputs ranging from 0.1 to 2.2kW, these pumps are suited for a wide range of applications besides general pumping and drainage, including slurries, residues and household uses. Though compact in size, these pumps pack a host of proprietary technologies that Tsurumi has tested and proven over many years, including the anti-wicking cable, inside mechanical seal with silicon carbide face and Oil Lifter,* etc. Additionally, key components that are prone to wear are made of durable materials and pumps as a whole are designed for continuous duty. For these reasons, Tsurumi single-phase portable pumps are a popular choice at civil engineering, construction and other work sites that demand high reliability. 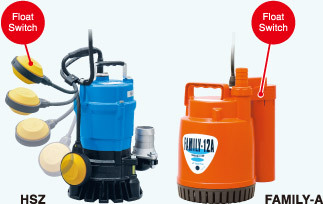 Tsurumi has been manufacturing construction dewatering pumps for more than 40 years. This has led to numerous technologies and know-how for improving the durability and maintainability of pumps in the rental and construction markets where rugged work environments demand heavy-duty specifications. All of Tsurumi's pumps are designed and built to be durable and reliable so as to serve users dependably. Prevents water incursion due to capillary wicking should the power cable be damaged or the end submerged. Detects excess heat, therefore, protecting the pump against overheating and dry-running. Directly cuts the motor circuit if excessive heat builds up or overcurrent occurs in the motor. Isolated in the oil chamber where a clean, non-corrosive and abrasion-free lubricating environment is maintained. Compared with the water-cooled outside mechanical seal, it reduces the risk of failure caused by dry-heating and adhering matter. The silicon carbide provides 5 times higher corrosion, wear and heat resistance than the tungsten carbide. Provides lubrication and cooling of the seal faces down to 1/3 of normal oil level, thus maintaining a stable shaft sealing effect and prolonging seal life longer. Used as a "Dust Seal", they protect the mechanical seal from abrasive particles. Can be configured for inclined or vertical discharge, allowing for smoother installation. This design provides maximum motor cooling efficiency allowing continuous operation at low water levels and extended dry-run capability, and also allows the shape of the pump to be cylindrical and slim for installation in a well casing for deep well dewatering. This design assures efficient motor cooling even if the pump runs with its motor exposed to air, and also allows the overall diameter of the pump to be reduced for installation in confined spaces. The pump has a spiral pump casing that facilitates smoother passage of foreign objects like mud and soil contained in the pumped liquid. It is a simple and practical design that facilitates inspection and repair work. The automatic model only operates when sufficient water is present. It not only reduces power consumption but also extends the life of wear parts of the pump as it eliminates dry-running that causes early wear-out. 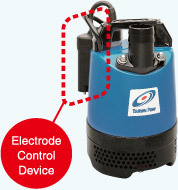 Tsurumi has developed a unique automatic control device utilizing electrodes. 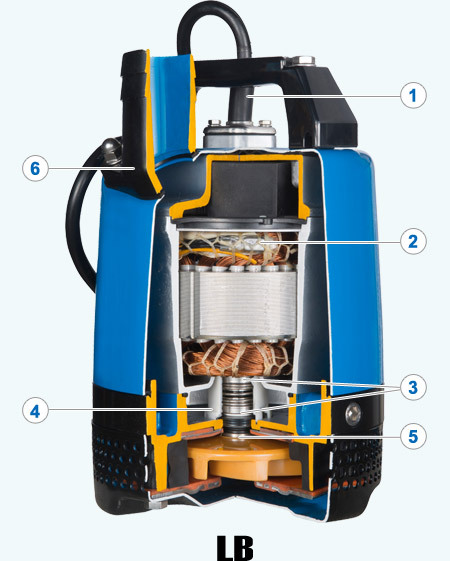 The pump stops automatically in about one minute after the water surface falls below the electric probe. Since this mechanism eliminates dry-running, the pump can reduce power consumption by up to 40 percent compared with non-automatic pumps (Tsurumi comparison). It also prevents chattering caused by a turbulent water surface and extends operating life. This automatic operation system is controlled by a float switch. When the water level rises and raises the float switch to a preset level, the switch turns on, and the pump starts. When the water level lowers to the preset level, pump operation stops.